First, separate the egg white from the yolk in two separate small bowls. In a medium bowl, whip up the egg white with a hand held electric mixer or food processor until foamy, thick and frothy but not too stiff like a meringue. Put aside. In another bowl, using the electric hand mixer or in the food processor, whisk or process the egg yolk, while the motor is running, gradually adding the juice of 2 lemons and continue mixing. Gradually and slowly add the oil in a steady stream until all is well emulsified. Add the dry mustard, garlic, salt and pepper and continue mixing well for another minute or so. Now, by hand, with a large spoon, fold in the egg yolk mixture into the egg white to incorporate both mixture. 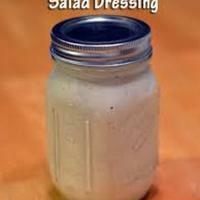 You now have your garlic dressing. For optimum flavour, make a day ahead and let it sit in the refrigerator for the flavours to develop. OPTIONAL: Add a dash of hot sauce if you like spicy dressing. Cover and keep refrigerated. Serve on top of a garden salad or salad of your choice. NOTE: If you find the dressing too tangy for your taste, next time use 1 oz of white or red wine vinegar and the juice of one lemon instead of the juice of 2 small lemons. Enjoy! Yum. I'm all over this, but will use Colman's dry mustard. Nice one. i needed this for a recipe i want to try.